In Metroid Prime we had Baby Sheegoths, little monsters known for how disturbingly easy they are to kill, despite their aggressive appearance. In Metroid Prime 2: Echoes, there are Grenchlers. When most players first encountered these beasts, they probably thought that they were going to be pushovers like the creatures that they were based off of. That is, until they found out that they were not only faster and stronger than Baby Sheegoths, but that they could also fire highly-damaging beams of electricity from their horns. At least you can hide in the water, right? Actually, that’s the worst place you could possibly be when being chased by a Grenchler, due to the fact that they can swim. They can jump too, so don’t think about hiding on raised platforms, either. Then how do you take down these beasts? You should always fight Grenchlers on land, even when you have the Gravity suit. They only way you can damage them is by destroying their shell and shooting at the exposed flesh. In order to do this, you should always keep your Power beam charged. Don’t bother with missiles, as they’re weaker than fully-charged shots. Now all you have to do is strafe around him and keep yourself out of the Grenchler?s reach. Don’t get too close, but don’t get too far. If you’re too close he’ll bite you, but if your too far away it’s easy for him to hit you with his beam. Once you’ve blasted his shell off, it should only take one to two charged shots to kill him. Dark Grenchlers can be handled the same way, but you should use the light beam instead. Dark Grenchlers are actually easier than the normal type, as the Light beam does more damage to them then the Power beam does to the Normal Grenchlers. The Dark beam is also effective against the normal Grenchlers (Don’t use it on the Dark ones! ), but it’s slower than the Power beam. 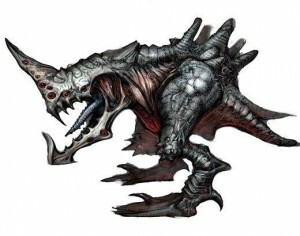 Congratulations, Grenchler, for making us Metroid fans regret making fun of those Sheegoths back in Metroid Prime, and for becoming the Alpha Dog of common enemies.